Cook these Peranakan dishes before they’re gone! Shrimp Paste Fried rice – Thai Styled! 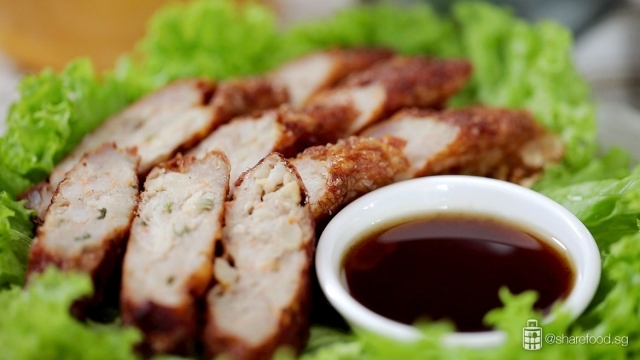 Thai Grilled Pork – Succulent. Juicy. Simply Irresistible. Crispy on the outside, soft on the inside! This unique Hokkien and Teochew dish is filled with all the goodness in each roll, and it will never be enough for everybody! 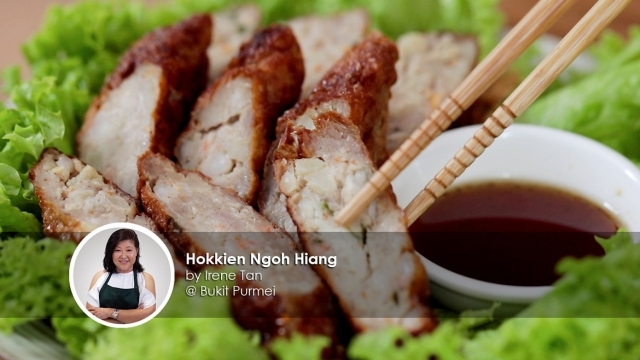 Here’s bringing to you Hokkien Ngoh Hiang and this recipe is brought to you by Irene Tan, where she shares her Ah Ma’s recipe. When a recipe is passed down from generations to generations, that’s when you know it’s good! This unique Hokkien and Teochew dish is filled with all the goodness in each roll, and it will never be enough for everybody! Before we start, here are some of the ingredients you will need: chicken and prawn meat, water chestnut for that extra crunch, carrot, spring onion, salt, garlic, tapioca and rice flour, five spice powder, dried sole fish, peeper, less salty bean curd sheet and an egg! 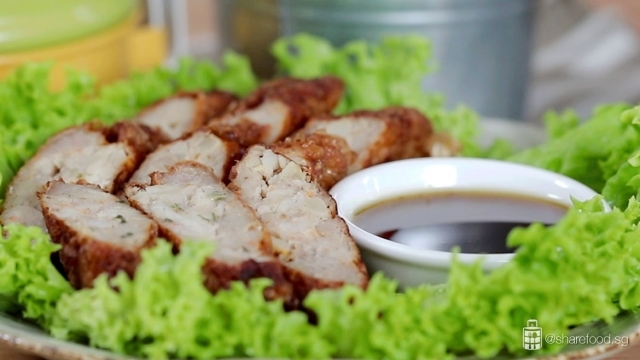 Let’s start making these delicious Ngoh Hiang. 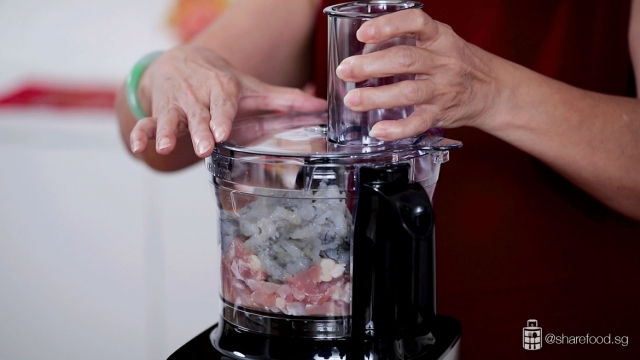 This powerful machine allows effortless blending even for tough meats like chicken thigh! To speed things up, we have used the Kenwood Multi-pro compact food processor! This powerful machine allows effortless blending even for tough meats like chicken thigh and it also comes with multiple attachments that allow the making of this traditional dish simpler! With the large capacity bowl, it can prepare ingredients that can serve up to 8 people! If you’re worried about the size, this processor is a compact version and it can fit into any kitchen! Not to mention that the cleaning is easy as well. 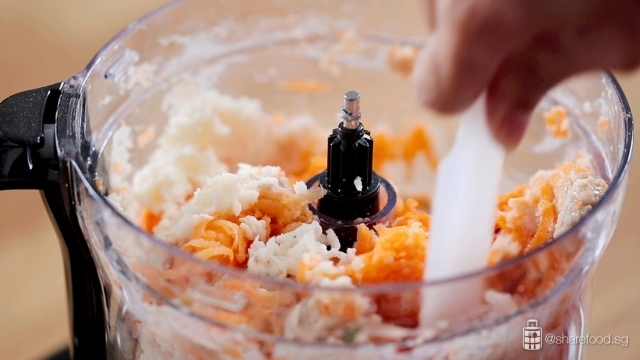 What’s even better is that this food processor is not only for preparing savoury dishes! Here’s a recipe to the Pineapple tart made using this food processor: https://www.sharefood.sg/2018/02/01/fortune-dog-pineapple-tart/. Blend it to mix the ingredients together but remember to not over blend so that you can still enjoy the meat texture when eaten! With the Kenwood Multi-pro compact food processor, attach the dough blade and pour in the chicken and prawn. Blend it to mix the ingredients together but remember to not over blend so that you can still enjoy the meat texture when eaten! Next, add in half an egg, galic, salt, fish powder, five spice powder, tapioca and rice flour and spring onion. Continue to blend for 30 seconds. Then, remove the blade form the food processor and attach the shredding disc with the largest hole. Shred the carrot and water chestnut into the mixture. Once it’s done, remove the disk and use a spatula to give it a good mix and set aside. Here comes the fun part! Cut the beancurd sheet into smaller pieces and clean the sheets with a damp cloth to remove excess salt. Scoop the filling and line it on the bean curd sheet. Then, brush on some egg wash and roll up! Ensure that the sides are sealed and remember not to wrap it too tightly as the meat may expand while cooking and we don’t want the beancurd skin to tear apart! It’s time to start cooking! 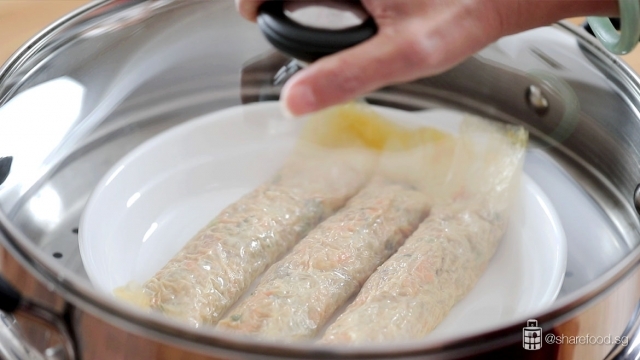 Arrange the Ngoh Hiang on a heatproof plate and steam it for 10 minutes and let it cool. 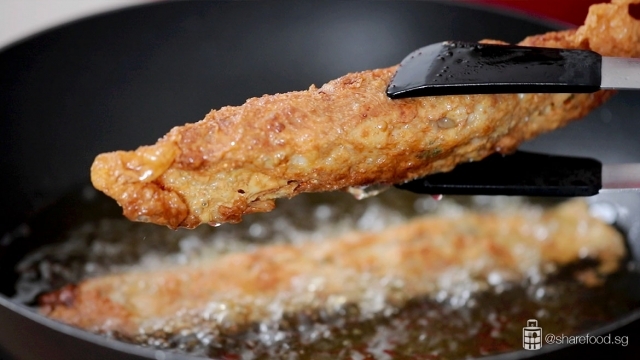 Next, heat up oil in a wok and deep fry the Ngoh Hiang until golden brown. Drain and lay it on a paper towel once it’s cooked! Proceed to cut and serve on a plate once it has cooled down. Go ahead and garnish with some lettuce and put some of your favorite dipping sauce beside it! One important tip is to make these in big batches so that when you’re craving for them, simply take them out to deep fry it. Learn this recipe today! Here’s wising everyone 新年快乐, 万事如意! Have a recipe that you would love to share with us? 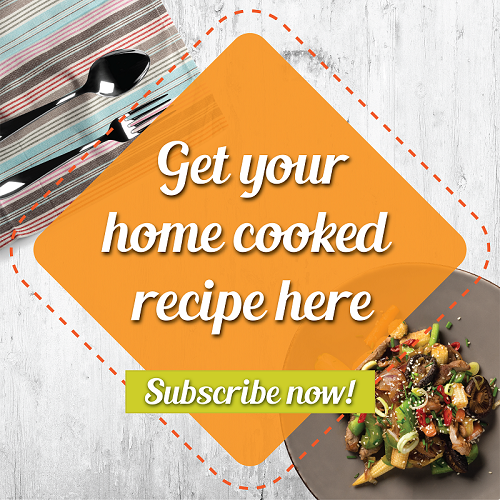 Send it to us at https://www.sharefood.sg/submit-recipe/! Grab the full recipe below now! In a Kenwood Multipro Compact food processor, attached the dough blade. Pour in chicken meat and prawn. Blend for 30 sec to mix the ingredients. #Tips: Do not over blend the ingredients so that you can enjoy the meat texture when eaten. Remove the lid, add in ½ egg, garlic, salt, fish powder, five spice powder, tapioca flour, rice flour and spring onion. Close the lid and blend for another 30 sec. Remove the blade from the food processor. Attached the shredding disc with the largest hole, shred carrot and water chestnut into the mixture. Remove the disc, use a spatula to give it a good mix. Set aside. Cut beancurd sheet into smaller pcs about 8” x 5” rectangle. Clean the sheets with a damp cloth to remove the excess salt. Scoop 3 tbsp of the filling and line on beancurd sheet, leaving a 1 inch space on both ends of the beancurd sheet. Apply egg wash, roll up and ensure all sides are sealed. #Tips: Do not wrap it too tightly as the meat may expand while cooking and the beancurb skin will tear apart. Arrange the Ngoh hiang in a heatproof plate and steam for 10 mins and let cool for about 20 mins. Heat up the oil in the wok. Deep fry till golden brown. Drain the oil and lay it on a paper towel. Once cool, cut n serve on plate. Garnish and serve together with dipping sauce. Don’t forget to like and subscribe to Share Food Singapore!